The Ranger Rundown: Is Laynce Nix An Everyday Player? Is Laynce Nix An Everyday Player? The Dallas Morning News reported that Laynce Nix may undergo season-ending surgery to repair a torn labrum in his right shoulder. The news is startling because Nix injured his left shoulder against Oakland last week. If Nix does miss the rest of 2005, Texas will enter 2006 still unsure of whether Nix is worthy of everyday play. Early reports on Nix suggested he could be a “tweener,” someone who didn’t field quite well enough to play center but also wouldn’t hit quite enough to man a corner spot. Nix spent more time in right than center his freshman year, though he has since displayed sufficient defense prowess in center. The problem is, to date, he’s not hitting well even as a center fielder. On July 10, 2003, Texas recalled the 22-year-old Nix from AA, where he was batting a robust if unspectacular .284/.344/.487. Nix debuted with promise, and despite a weak finish he added some hope to yet another dire Ranger season. In 2004, he hit the cover off the ball for two months, tapered off for two weeks, then suffered a shoulder injury that cost him a month. Since then, he hasn’t hit at all, performing roughly at replacement level during the last calendar year. 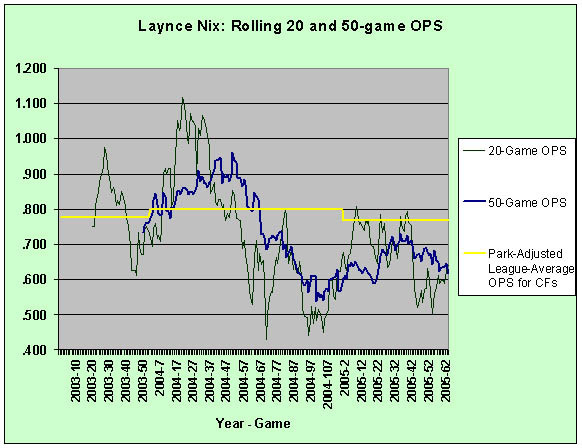 As shown in the jagged 20-game OPS line in the chart above, Nix only rarely attains mere adequacy with the bat. Nix’s rather disheartening lack of progress begs the question of why he reached the Majors at such a young age. He had all of 87 games of experience above A-ball when he debuted as a Ranger. Again, his performance in AA was strong but hardly eye-popping. Why catapult him all the way to Arlington? The answer goes back to Spring Training of 2003. Having made the obvious yet belated discovery that Carl Everett was no longer a center fielder, Texas started Doug Glanville in center for the season’s first two weeks. When he fell to injury, they recalled Ryan Christenson. Christenson hit .179/.255/.255, excellent stats if your home park is in a 2.5-G environment like the planet Jupiter. Texas traded Everett at the end of June and rookie Kevin Mench suffered a broken wrist on July 9th. On the morning of July 10th, the roster contained three healthy outfielders: Glanville, Juan Gonzalez and Ryan Ludwick. Enter Laynce Nix. Whether or not Texas rushed Nix, the operative question is whether they can make the 2006 postseason with him in center field. Nix’s bugaboo has always been plate discipline. Rare talents like Alfonso Soriano can excel despite their dreadful walk and strikeout ratios, but Nix doesn’t hit for power or contact like Soriano. 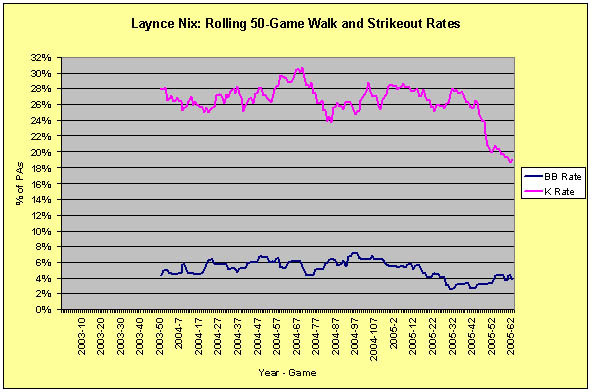 In 2005, Nix has shown genuine improvement in his strikeout rate. Unfortunately, his walk rate has fallen to a Ramon Nivar-like level. Nix doesn’t turn 26 until February and has time to improve, but Texas might not be able to wait. They are expected to contend, not just compete. If Nix can return during the season, Texas needs to play him every day. They’ll need those extra data points come winter, when they have to decide whether an upgrade at the position is necessary.